Adaptation is architecture’s new frontier. On the edge of Sydney National Park, the Burrawong House transformation establishes compelling links between the dwelling and surrounding bushland, providing opportunities for serenity and retreat. We were engaged by our clients from the very conception of the project, working with them over a 15 month period in assisting with identifying an ideal site that captured both tranquillity and suburban amenity. The simple volume of the original 1970s clinker brick house provoked specific formal responses, with additions designed to nestle under and into the gable roof line, while interacting with the landscape in plays of light and shade. 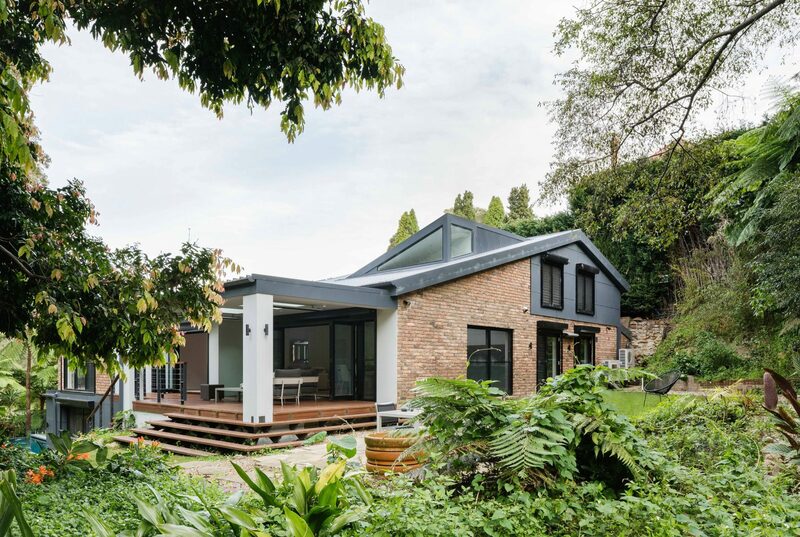 Key design elements such as picture windows, clerestories and raked ceilings are exploited to offset the cooler, shaded bush elevations and deal with bush fire zoning. An equilibrium of spaces come together, so the house works vertically, as well as horizontally. Additions include an upstairs bedroom, a music studio nestled in the underfloor space of the original dwelling and an enticing lap pool that reaches into the bush. They are softer, transitional spaces that collectively help focus the house on quiet beauty, bowing to the bush and breathing it in.